EZ-Tilt Adj. Height Mobile Round Cafe Table 30" dia. Tired of having to find chairs that match up with your cafeteria tables? Adjustable-height tables offer the flexibility you need so you can have a perfect fit for almost any chair. Make your life a whole lot simpler with EZ Tilt Cafeteria Tables. Arranging, storing and transporting tables has never been so easy. 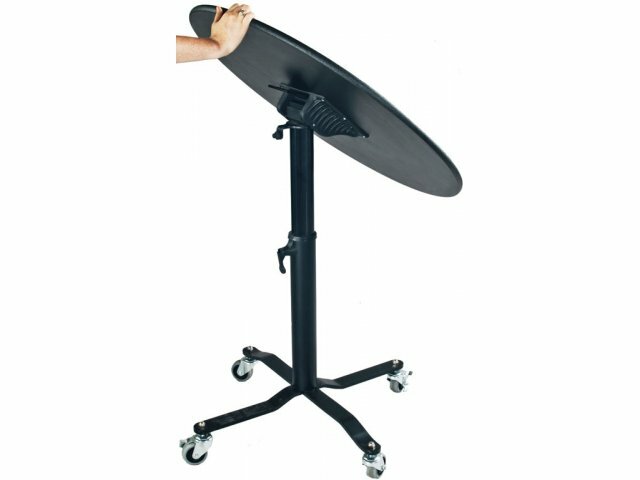 Need to get your lunchroom tables out of the way in a flash? Just pull the spring-loaded T-Autolock as you lift the tabletop, and fold vertically. A gas cylinder gets the process moving quickly. 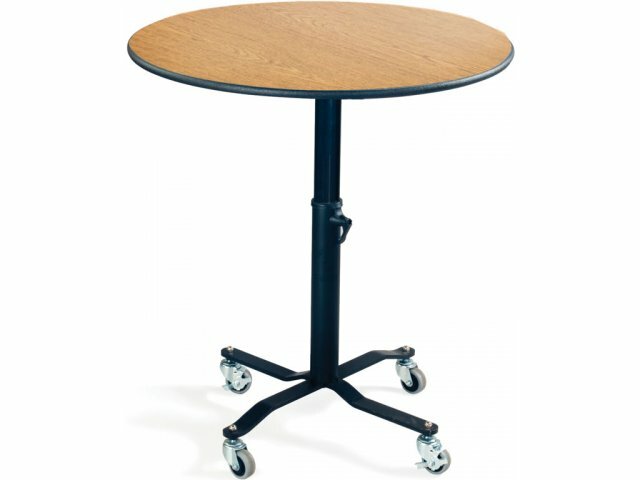 When its time to reset the room, just roll tables into place on the attached casters and smoothly lower the tabletop into the flat open position until the T-lock clicks. Once the top is in position, the casters lift up to prevent rolling. To save you time and effort, low-maintenance seamless tops make wiping away crumbs, spills and germs a cinch (except model ETT–6072 oval table). Easy nesting and a tough design make these cafeteria tables the perfect choice for your bustling lunchroom. Spring-loaded lock enables table to be locked in both folded and unfolded positions and makes folding and unfolding easy and safe. Compact Storage: EZ-Tilt tables nest easily and compactly to save space in your storage closet. Enhanced Edges: Dyna–Rock banding seals and protects table surfaces, creating tamper– and dent–resistant tables. Smooth Setup: Just lower table from vertical storage position into flat open position until T-lock firmly engages onto table with a click. Quick Close: Simultaneously pull spring loaded T-Autolock and lift table top, then fold vertically for storage. 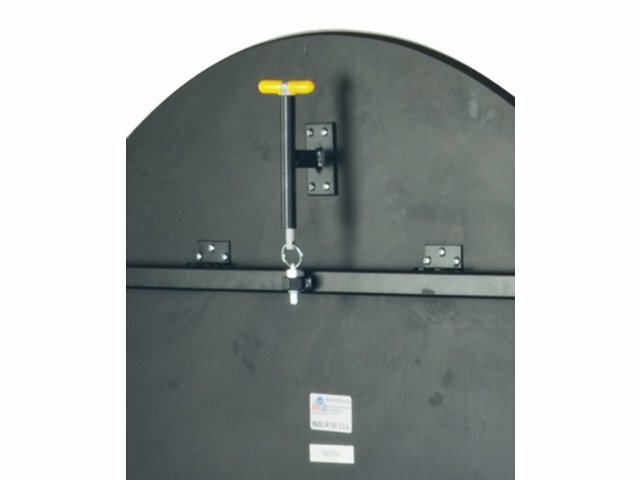 Fast Mechanism: Special high-speed gas cylinder for quick and smooth folding. Easy Cleaning: A seamless top allows for quick, easy cleaning before, during and after dining (except model ETT–6072 oval table). Balanced Construction: A well-balanced, strong underside with 14 gauge steel construction keeps table flat and sturdy for years of service. 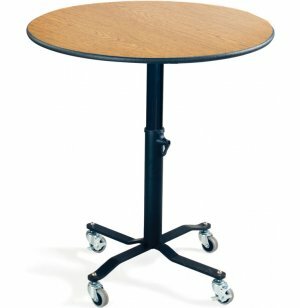 Smart Roll: Smooth rolling casters lift up when table is unfolded so it won't roll while in use.